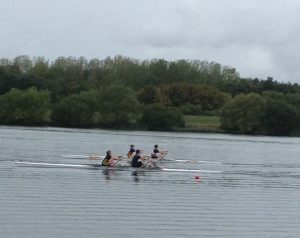 LBC headed south last weekend to compete at the Milton Keynes Regatta in a quest to win the Andrew Hill Masters Award. 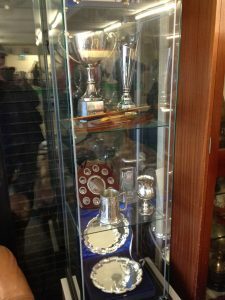 This trophy was generously commissioned by Milton Keynes Rowing Club in memory of Andy, a stalwart member of LBC, who sadly passed away at the Milton Keynes Regatta in 2016. 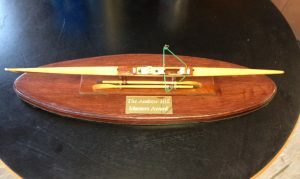 The trophy is awarded at the Regatta each year to the Club with the most wins at Masters level, and takes the form of a beautiful handmade scale model of a sculling boat complete with oars, skilfully crafted out of wood using traditional boatbuilding techniques. Three lane racing over 500metres on Caldecotte Lake provided a novel and succesful format, allowing more races to be fitted in to the day but also still proving the opportunity of a second round for classes with more than three entries. Furthermore, the tactical side-by-side element remained strong, unlike the sometimes detached races on bigger multilane courses. In an attempt to oust Milton Keynes as the current holders, Loughborough put in a strong Masters entry and achieved several extremely close finishes, but disappointingly failed to register a win. However, the very last race of the day between two Mixed Masters Eights from Loughborough and from Milton Keynes provided a fantastic finale as both crews fought it out neck and neck the length of the course, with Milton Keynes prevailing by a canvas. The overall winner this year was Oundle Town Rowing Club who claimed the Andrew Hill trophy with a total of four wins. Loughborough had more success at Open level, with Alex and Hannah once again dominating their classes and both winning two events in single and double sculls, whilst Hannah also successfully crewed up for the first time with Zoe in the Womens Double. Victories were registered against Oxford Academicals, Wolfson College Oxford, and Peterborough City, amongst others. 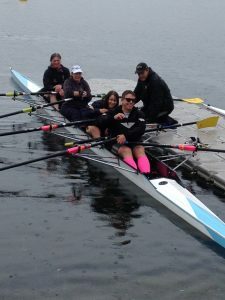 The club’s Junior rowers found conditions slightly more challenging against strong opposition on the open three-lane lake, but Thomasin pulled a length clear in the Junior 15 Single Scull final to beat her opponent from Peterborough City. This final victory of the regatta season adds to a long list of impressive wins by Thomasin over the course of this Summer.